The law says that landowners, caretakers, management companies and lessees have a duty to ensure that their properties are in a reasonably safe condition, or to adequately warn and take steps to protect people from known and existing dangers. Proving that they breached that duty is where recovery gets complicated. At Brady, Brady & Reilly, we understand the complexities of premises liability laws and the elements plaintiffs must show if they are to prevail on their claims. We understand these things, because attorneys at our firm have been handling slip and fall accidents and other types of property-related injuries for more than 30 years. For a free consultation with lawyers who can put that kind of experience to work for you — call or contact us today. Property owners and businesses will often try to avoid liability for slip and fall injuries by claiming they had no knowledge of the dangerous condition, or no way of knowing it existed, or that they had not had a reasonable amount of time to warn people or take corrective measures. They may also try to cast doubt on the validity of serious accidents that were not reported promptly or injuries that did not receive prompt medical attention. By involving us in the case as soon after your slip and fall accident as possible, our attorneys can make certain that the incident is reported properly and help you get the medical treatment you need. We can also move quickly to begin our own independent investigation and to work toward achieving the best possible resolution of your claim. Time to file your claim may be running out. Talk to one of our attorneys about your slip and fall accident today. 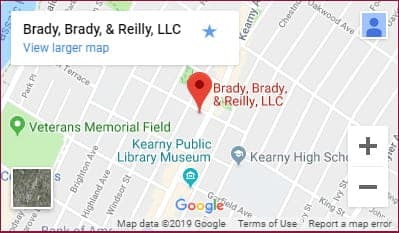 For a free consultation — call our Kearny, New Jersey law offices directly or feel free to contact us online as well.